The vast majority of these songs had already been written and arranged prior to the recording of the debut. Many of the songs hail from the same song writing sessions that produced their first long player. Since they largely already had a bunch of material ready this album appeared only six months after its predecessor. They sound more assured this time round, perhaps due to greater experience in the studio. The keyboard bass was replaced by a sessioneer on regular bass guitar for part of this record. It sounds slicker than previous recordings. We open with the title song. The keyboards swirl in madness, Morrison’s voice booms out loud and clear and it’s a fine song. A good start to the record all round as ‘You’re Lost Little Girl’ and ‘Love Me Two Times’ follow. The lyrics to ‘You’re Lost Little Girl’ and the tone of Jims voice gets to me every time. ‘Love Me Two Times’ is just stupendous! Especially arriving on the heels of the previous track. ‘Love Me Two Times’ works as a great rock song with a groovy rhythm! The Doors once again prove themselves adept at middle section breaks when great piano comes in guaranteed to raise a smile! A superb song all round. ‘Unhappy Girl’ despite the lyrical tone is lighter musically but extremely melodic with it. The music contrasts the lyrical content and helps you focus on the words, actually. Fine words they are too. ‘Horse Latitudes’ is very hard to take seriously. Musical effects bordering on the humorous despite their admittedly unsettling nature accompany Jim in preacher voice, reading out his spoken word poetry. Thankfully its short. It does serve a purpose breaking up the record sonically. In a sense its there to provide variety. 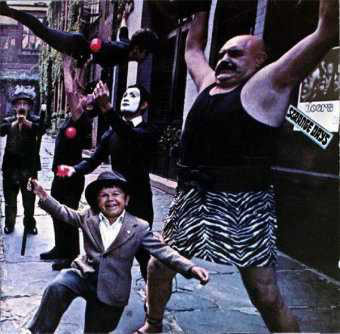 One of the Doors earliest songs gets a recorded appearance next. ‘Moonlight Drive’ is another fine song on an album full of them. Very little faulting this record, actually. ‘People Are Strange’ has been covered a number of times and with good reason. Another fabulous set of intriguing lyrics and music full of hooks but without neglecting depth. ‘My Eyes Have Seen You’ is a great phrase to build a lyric around and the music is up-tempo and features plenty of Ray attacking his instrument with vigour! ‘I Can’t See Your Face In My Mind’ slows things down, sounds unusual but perfectly natural at the same time. Some exotic sounding guitar playing in particular a highlight of this track. Another great piece of cover art, incidentally, cementing The Doors position as a band that were indeed different from the norm. The epic eleven minutes plus ‘When The Music’s Over’ closes the record. Strange Days indeed? It features Rays keyboard bass, is wonderful throughout and drags the album up a notch all by itself. Very intense and full of passion. Great playing from Ray, Robbie and John. We do have ‘Horse Latitudes’ however. We also have admittedly ‘Love Me Two Times’, ‘People Are Strange’ and ‘When The Music’s Over’. But, these apart, the record lacks obvious standouts of such a quantity as their debut. All the songs are still pretty great though and overall this is another fine and frequently exhilarating ride, no doubt about it! This entry was posted on Thursday, January 20th, 2011 at 7:10 PM	and tagged with Arts, Doors, Jim Morrison, Love Me Two Times, Lyrics, Music, Rock Band 3, Rock music, Shopping, When the Music's Over and posted in Music Albums Reviews, The Doors. You can follow any responses to this entry through the RSS 2.0 feed.